Finding that perfect channel that plays your kind of tunes 24/7 can be a frustrating experience. Cameron Communications is excited to bring you 50 channels of uninterrupted music straight to your TV with Stingray Music! The new network, Stingray Music, features 50 brand-new music channels. The network’s huge library of music, which can be found in every Cameron Communications service area on channels 931-980 beginning April 2nd will keep you humming, dancing, tapping or bursting into song at any time of day. Stingray’s music channels feature stunning visuals that match each genre of music, turning your television into digital artwork. Each channel is programmed by a music industry expert. You can also access Stingray Music online. An app available for download at the Apple Store and Google Play makes your music channels portable so you can listen at the office, a friend’s house or a backyard party. 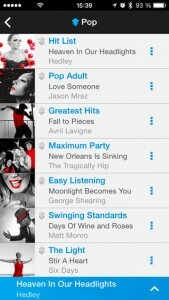 It’s easy to pick your favorite music station with the Stingray Music app. To spare your mobile unit bandwidth for other things, you can even program it to play music only when you’re connected to Wi-Fi. The app is free. Once you sign up, Cameron Communications digital cable subscribers can access their favorite music online at no additional cost. Whether you’re a fan of classic rock, smooth jazz or classical, roots or pop music, Stingray Music has the perfect channel for you. Use the channel guide below to find the new Stingray Channel that plays all your favorite tunes!